I think these would be excellent points, if only he had applied them to the United States as well as the rest of the world. He called for an intensification of economic and diplomatic warfare against North Korea, Iran and Venezuela, his new axis of evil. How is this in the interest of the American people? How is this consistent with respecting national sovereignty? Are not North Korea, Iran and Venezuela sovereign nations? The United States has paid radical jihadist terrorists to overthrow the government of Libya and is attempting to use them to overthrow the government of Syria—two sovereign states that never have threatened the United States. The result has been to reduce these two countries to chaos and misery, as the cost of thousands of innocent lives. He accused the North Korean government of starving and torturing its own people, and various other crimes, which were real though not necessarily current. But then he threatened an even worse atrocity. To be fair, it is not clear whether he is threatening North Korea with attack merely if it fails to disarm or whether he is threatening retaliation in the event of an attack, which is different. This ambiguity may be deliberate on President Trump’s part; he may think keeping others guessing is a good negotiating strategy. Where nuclear weapons are concerned, this is dangerous. It may lead the other person to think he has nothing to lose by launching an attack. I’m a provincial American. I am not widely traveled, and I get most of my information about foreign countries by reading books and magazine articles. Over the weekend I read a magazine article about the late Hugo Chavez that made me think that his attacks on civil liberties and his mismanagement of the Venezuelan economy were worse than I had assumed. The writer, Daniel Lansberg-Rodriguez, a journalist who divides his time between Venezuela and the United States, wrote as follows in the Boston Review. It did not take long for me to realize that, to Chávez, the country’s future did not have much use for its current middle class: hard-working men and women who were treated increasingly like enemies of the state. Much of my family started to leave Venezuela. The first wave was seeking greener pastures; later they would leave out of fear. Yet while I may have disagreed with Chávez and disliked the direction he was steering the country, my real, personal struggle against the Venezuelan regime began with the demonstrations of May 2007. Chávez had closed down Radio Caracas Television, thereby silencing the sole remaining national broadcaster critical of his government. I joined thousands of protestors, mostly students, who descended on Caracas’s Plaza Brión. While government loudspeakers warned us to remain calm, police fired teargas, rubber bullets, and water cannons into the crowd. I staggered away from the chaos. Although a vinegar-soaked rag covering my mouth and nose staved off total physical collapse, the mixture of teargas and sweat had caused me to expel my contact lenses. Once the twin adrenaline shots of fear and indignation subsided, I faced a long, largely blind, walk home. Squinting, crying, and filthy, I was reborn. At that moment, I hated Hugo Chávez. He wasn’t misguided, he wasn’t a comical buffoon, and he wasn’t a sign of change. He was horrifying: a violent and cruel despot who ruthlessly crushed dissent, even from unarmed students, and threatened the human rights of anyone who disagreed with his policies. Click on The Little That Hugo Chavez Got Right for the full article. The problem with Hugo Chavez’s Venezuela was the lack of the rule of law. That was the problem both with his crackdowns on his enemies, and his expropriations of businesses. Everything depended on the will and whim of a single individual. An authoritarian government with extremely restrictive laws is less bad than an arbitrary government which leaves its citizens in doubt as to what is, and isn’t, against the law. That is why the U.S. Constitution, even before it included the Bill of Rights amendments, prohibited ex post facto laws, bills of attainder and denial of the right of habeas corpus. That means the government is forbidden to punish you for something that was legal at the time, it is forbidden to outlaw particular individuals or groups and it is forbidden to arrest people without taking them before a magistrate and telling them what law they are accused of violating. But I think it is necessary to keep Hugo Chavez’s record in perspective. 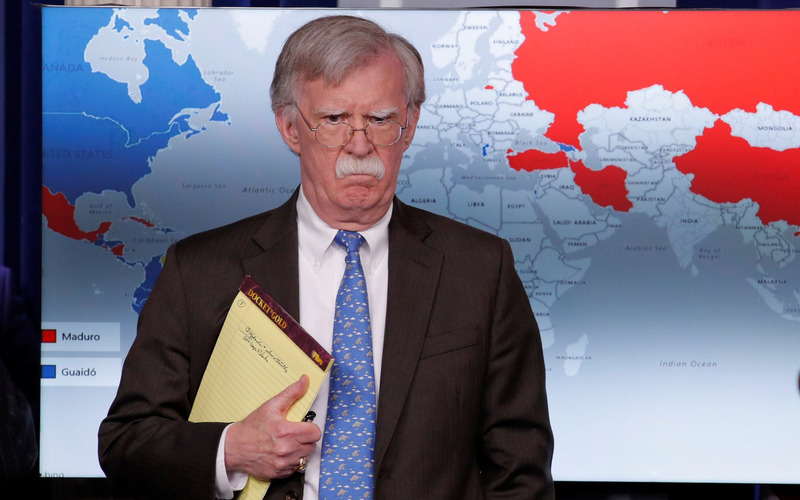 Nothing happened in Venezuela during his administration that compared with the reigns of terror in Chile under General Pinochet, Argentina under General Videla or the various U.S.-backed Central American dictatorships. There were no mass executions, no death squads, no “disappearances”. Daniel Landsberg-Rodriguez continued to write a weekly column for a Venezuelan newspaper. 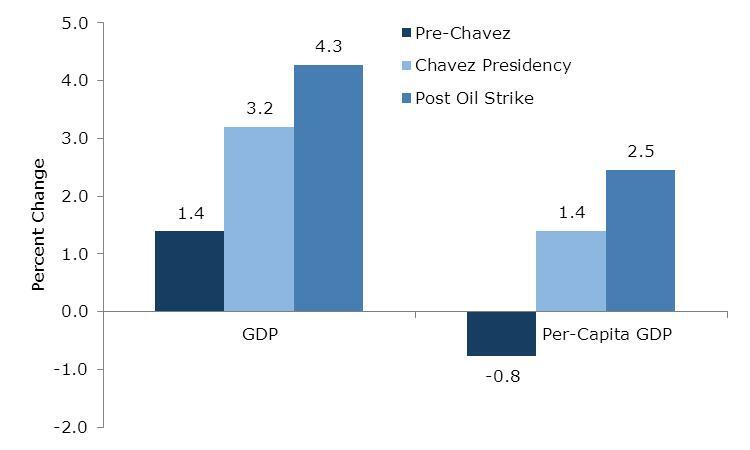 Venezuela’s economic growth during the Chavez era was due more to the worldwide rise in oil prices than the Chavez government’s expert management. But many countries have amassed huge oil wealth without improving the well-being of their people. Chavez’s Venezuela enjoyed not only good economic growth, but reduction in poverty and improvement in education and living standards. 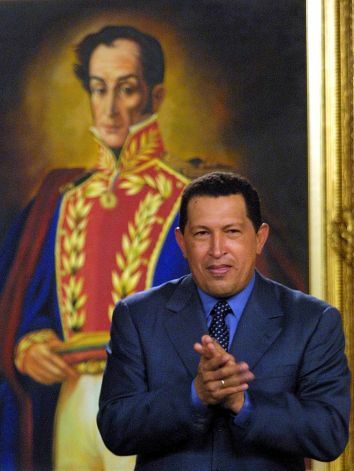 My final thought about Hugo Chavez (for now) is that he was a leader who did good, but who did good badly. In the early part of the previous decade, I was invited by some friends to participate in a discussion group on issues in American foreign policy. Our group used background materials on different discussion topics provided by the Foreign Policy Association, an organization of present and former government policy-makers and high-ranking academics, whose stated goal is to better inform the American public on foreign policy issues. One of the questions we were invited to discuss was what to do about Hugo Chavez, the Venezuelan strongman. I had never given any thought to Hugo Chavez, but it was explained to me that he was taking on too much power and was a threat to Venezuelan liberty and democracy. I didn’t see why that was something that I, as an American, should be concerned with. If Venezuelans thought he was abusing the power of his office, they could vote him out. They certainly understood their situation than I ever could by reading a few magazine articles. I thought President George W. Bush was abusing the power of his office, and I hoped Americans would vote him out in 2004. This didn’t happen, but I don’t think that the situation would have been helped by foreign interference. I now know why the Foreign Policy Association was so upset with Hugo Chavez. As Greg Palast and other journalists have shown, it partly because he doubled Venezuela’s royalties on sales of oil produced in that country, but also because he got Venezuela out from under the thumb of the International Monetary Fund and the Wall Street banks. Chavez withdrew the money Venezuela had on deposit with U.S. and international banks, paid off its IMF debt and used Venezuela’s oil income to bail out other Latin American countries. Everyone I’ve read agrees that Chavez done a lot to increase the well-being of the Venezuelan people. The poor and working people of Venezuela are better-fed, better-housed and better-educated than they were prior to 1999, when Chavez became President, and the Venezuelan economy has grown. His critics say that he has failed to maintain the physical infrastructure of Caracas and of Venezuela’s oil industry—in other words, that he may have invested in Venezuela’s human capital, but neglected its physical capital. The best rejoiner to that was made, perhaps inadvertently, in an article by the Associated Press business reporter immediately following Chavez’s death. Chavez invested Venezuela’s oil wealth into social programs including state-run food markets, cash benefits for poor families, free health clinics and education programs. But those gains were meager compared with the spectacular construction projects that oil riches spurred in glittering Middle Eastern cities, including the world’s tallest building in Dubai and plans for branches of the Louvre and Guggenheim museums in Abu Dhabi. Whatever you may say about Hugo Chavez, he did not waste his country’s wealth on status symbols and conspicuous consumption for the elite, as is being done by the hereditary Arab monarchs of the Persian Gulf. Chavez was friends with other Latin American leaders, from Fidel Castro, Cuba’s Communist dictator, to Luiz Inacio Lula da Silva, the respected progressive reformer who was then President of Brazil. Their common denominator was a determination to be independent of U.S. foreign policy and foreign business corporations. While Chavez admired Castro, I don’t think he took Castro for a role model. Chavez did, it is true, force the Venezuelan newspapers and TV broadcasters, who were unanimously against him, to carry his speeches and broadcasts. He threatened opposition politicians whom he accused of receiving foreign money. I don’t agree with this, but I can understand the frustration of a political leader when the entire news media, not just part of it, is in the hands of the equivalent of Rupert Murdoch. I think it would have been better for the Venezuelan government to create an official newspaper and broadcasting station and let the private companies alone or, better still, to empower labor unions, farm cooperatives, universities and other people’s organizations to create their own news media. In any case, the opposition press and broadcasters were not silenced. Chavez had a large and vocal opposition. He risked his power in contested elections, which Castro never would have done. Ex-President Jimmy Carter certified that Venezuela’s elections were real elections, not the phoney kind in which the ruler gets 95 percent or more of the vote. The President of Venezuela, unlike current and recent Presidents of the United States, never ordered the invasion of any foreign country. He never claimed the power to arrest and torture people, nor to order the killing of people, both inside and outside Venezuela, without any legal process, based on his sole determination that they are terrorists. If you want to criticize Chavez, it would be for letting things get out of hand, in a way that Castro would not have tolerated. Venezuela has a high and growing rate of violent crime. Chavez invited poor people to take over vacant office buildings and unused farm land. Jon Lee Anderson of the New Yorker wrote an article about his efforts to find out what goes on inside. His article implies, though it does not prove, that they are like public housing projects in the United States that have been taken over by criminal gangs. The American political figure that Hugo Chavez most resembles is Huey Long, a radical populist governor of Louisiana in the early 1930s. He played brass-knuckle politics and was ridiculed as a buffoon, but he did a lot to curb the power of corporations and improve the life of people in Louisiana. But Long based everything on the cult of his own personality, and did not build any institutions to perpetuate his achievements beyond his death. Note: I made a number of small revisions and additions to this post some hours after it was originally posted. Above is a report by American investigative reporter Greg Palast was broadcast by the British Broadcasting Corp. on May 13, 2002 about the short-lived attempted military coup against Chavez in 2002. 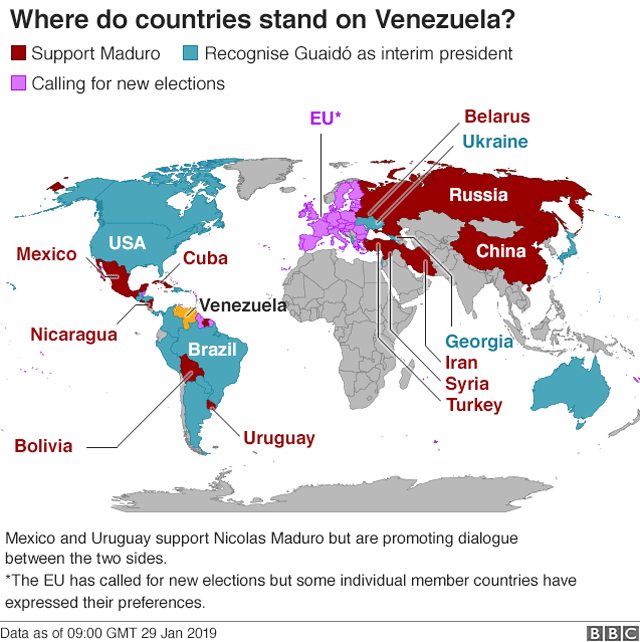 Below is a report by Palast for the BBC on April 3, 2006, which explains why the oil wealth of Venezuela is important to the United States. The most important fact about Venezuela, so far as the United States is concerned, is not that it is a major supplier of oil to this country. It is that Venezuela potentially has the world’s largest known reserves of oil, much more than Saudi Arabia. Most of Venezuela’s oil is a thick gunk called heavy crude oil, which is too expensive to refine as long as oil prices are low. Greg Palast said in his 2006 broadcast that heavy crude would be economically viable if world oil prices were $50 a barrel. He now reports Venezuela’s export price is $100 a barrel. What do we want—Venezuela’s heavy crude or Canada’s tar sands oil? 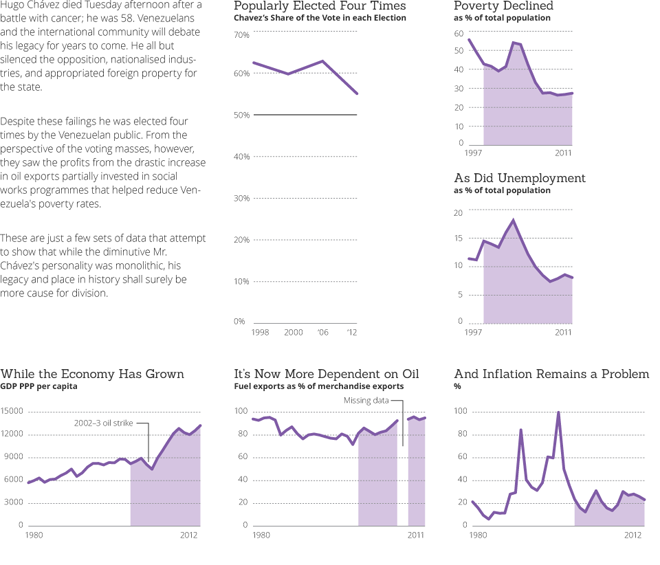 I came across this chart in a report by Jake Johnston and Sara Kozameh for the Center for Economic and Policy Research in Washington, D.C. Click on Venezuela: Economic and Social Performance Under Hugo Chavez, in Graphs for their complete report and more charts. Johnston and Kozemeh make the point that Venezuela was devastated by a strike in 2002-2003 by workers in the Venzuelan government oil company. It was only after the strike that the Venezuela economy really took off. 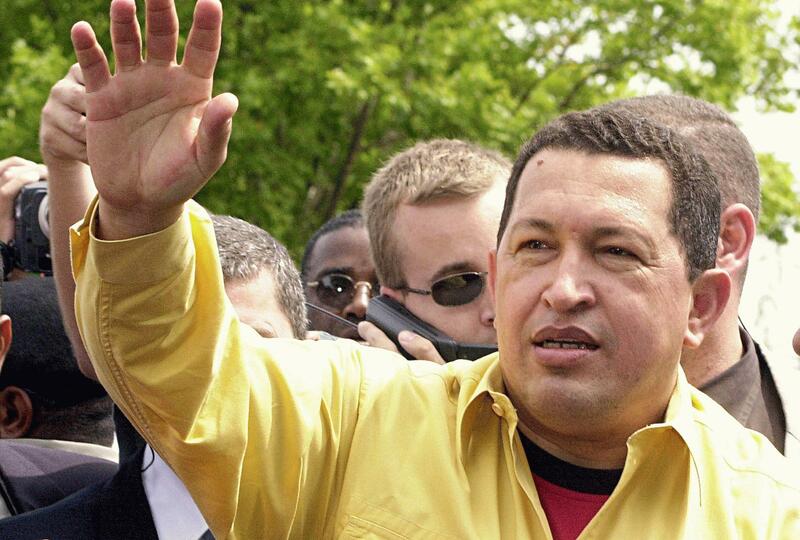 Hugo Chavez, the radical left-wing President of Venezuela, died last week. What was his legacy? His admirers say his policies changed the lives of poor and working people in Venezuela greatly for the better. His critics say he left the Venezuelan economy in a shambles. I think the figures on these infographics are as close as you can come to an objective answer. The first infographic is from The Guardian newspaper in England. It indicates that, during the Chavez administration, there was a big drop in the number of poor and unemployed Venezuelans, and the number of Venezuelan children who died in childbirth. The overall Venezuelan economy was strong. The value of oil exports rose, and economic output (GDP) increased. However, the Chavez government was unable to bring down the high rate of inflation, and the value of Venezuela’s currency, the Bolivar, fell against the U.S. dollar. 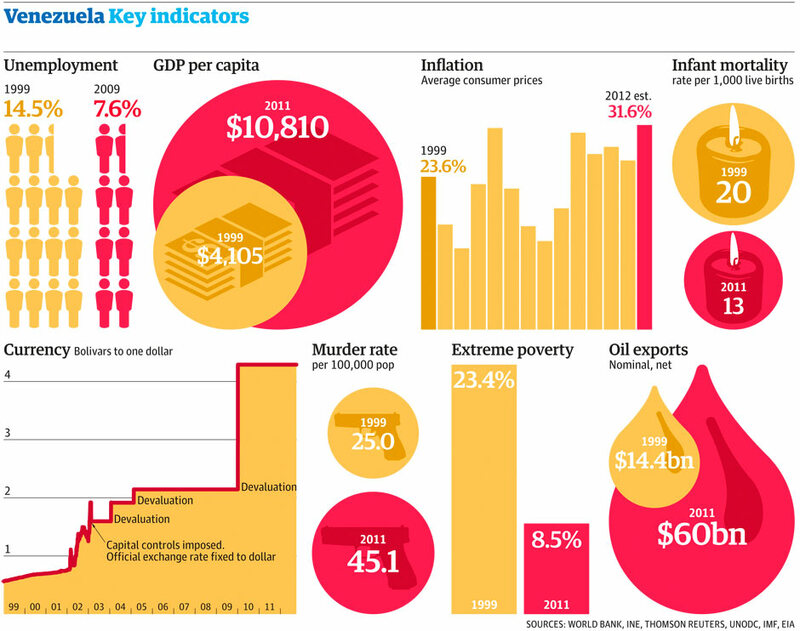 Chavez’s worst failure was the rise in violent crime. The murder rate almost doubled. The next chart is from the Brookings Institution in Washington, D.C. It basically tells the same story, but puts it in historic perspective, by showing figures prior to 1998 when Chavez was first elected. Economic growth was less under his predecessors, and inflation was even worse. The Brookings analysts said he “all but silenced” the opposition, but the charts show the opposition received a substantial portion of the vote in all four elections, and a larger percentage in the fourth than in the first. The last infographic, below, is from RIA Novosti, the official Russian news agency. It shows that while Venezuela’s oil revenues increased under the Chavez administration, oil production languished. Chavez’s admirers say that this was a policy decision, for the purpose of keeping oil prices high (by avoiding a glut on the market) rather than depleting a non-renewable resource. Chavez’s critics say it was a result of a failure of the government-owned oil company to invest in keeping up oil production, which would bode poorly for Venezuela’s future. Maybe the truth is somewhere in between. Are Venezuelans better off under Chavez? Hugo Chavez is running for a third term as President of Venezuela in an election to be held Oct. 7. Last week Al Jazeera English held a panel discussion on whether the radical left-wing President has done a good job. The verdict was generally favorable. One panelist didn’t think Chavez is radical enough—a view I wouldn’t expect to hear on U.S. television. The panelists concluded that poor Venezuelans have better access to jobs, schooling, health care and housing under the administration of President Hugo Chavez than they would otherwise have. But they note that Venezuela is troubled by a high inflation rate, a high rate of violent crime and excessive dependence on its oil industry. Moreover, they say, Chavez’s Bolivarian movement is organized around the cult of Chavez’s personality, and might collapse if Chavez, because of ill health or for other reasons, might leave the scene. They did not discuss Chavez’s deplorable human rights record, including his attacks on freedom of the Venezuelan press, which he said is controlled by the wealthy oligarchy which seeks his overthrow. That is a problem in many countries, for which I don’t have a good answer, although I come down on the side of freedom of the press. The ideal would be to have newspapers and broadcasters with diverse ownership—some owned by corporations, some by labor unions and farmers’ cooperatives, some by political parties, some by universities and the church. But I don’t see a practical path to that ideal, and I’m not sure how stable the situation would be once achieved. I think of Chavez as a Latin American equivalent of Louisiana’s Huey Long—a brass knuckle populist and demagogue who has done a lot to improve the lives of ordinary people, but with little regard for due process of law or democratic procedures. Concentration of arbitrary power into the hands of a single individual is a bad idea, even when the person uses the power for good, because some other individual can and probably will use that power to wipe out the good the first person has done. But, like Huey Long, Chavez probably is no worse than his opponents. 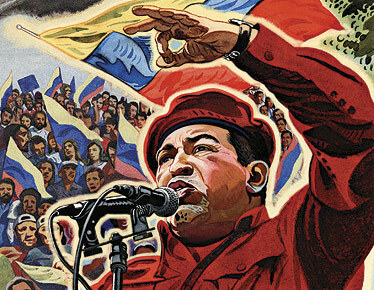 Click on World Report 2012: Venezuela for Human Rights Watch’s report on Hugo Chavez’s bad human rights record.